The butterfly is one of the most beautiful creatures of the world. According to entomologists there are a total of about 140,000 species of 77 families of butterflies in the world. Of this number, about 12,000 species of 40 families have been found in Thailand. The Thais distinguish the butterfly from the moth by referring to the former a phi suea klang wan and the latter as phi suea klang khuen, meaning daytime phi suea and nighttime phi suea respectively, since the former is dirunal while the latter is nocturnal. The butterfly is different from the other types of insects in two aspects . First, it has tiny scales on its wings that constitute the sources of its beautiful colours. Second, it has a sucking tube functioning like a mouth. Few living things in Southern Thailand can rival the beauty of the many species of butterflies and moths. Plus, they're everywhere. From Khao Sok Naitonal Park, to Khao Nor Chuchi, to the smaller parks and the islands. It is common to come upon a group of mixed species of butterflies on the ground. In most cases, they're after the salt left in the dried urine of animals. Of course, the many species of flowers that decorate the Kingdom are also a wonderful places for butterfly and moth encounters. 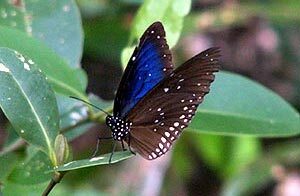 Two very easy places to see butterflies is Raman Forest Park and Manora Forest Park in Phang Nga Province. For some wonderful reason, butterflies are extremely common here. Chiang Mai's location makes it a meeting point for butterflies from India, Nepal and China as well as many found in Peninsular Thailand and Malaysia. In all, around 520 species have been recorded here. There are two nice places in Thailand , both in Phuket. 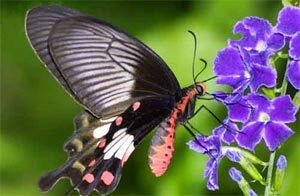 To view these attractive creatures : Phuket Butterfly & Aquarium and Talang Butterfly Farm. The former features over 4,000 live butterflies of 150 species with an anquarium section where 300 species of colourful sea lives are displayed. The latter is a breeding farm for exporting to around the world which contains breeding rooms showing the life cycle of butterflies both domestic and foreign and which also exhibits other insects and reptiles.